Throughout history different civilizations and cultures have established for themselves a set of values that they hold in high esteem. Although some of these may seem frivolous, even stupid, to other rival cultures, nevertheless they were and are the fundamental yardsticks of each of those particular cultures, nations and/or civilizations – values they hold dear. How were these primary values established ? Again, going back into history we find such values were derived and molded through their particular religious beliefs. Whereas to White Europeans a cow is just a cow, a useful animal that is not too bright, yet to Hindus a cow is a sacred object, a holy animal, due untold respect and veneration. Why is a cow holy to Hindus ? Because their religion tells them so, and theirs is not to question why. To Moslems, Mecca and Medina are holy shrines because their religion tells them that’s the way it is. To Jews, Moses, Abraham, Isaac and Jacob and a whole passel of other Jewish scoundrels are their national and religious heroes. The Christians have their Jesus Christ, etc. I have listed a few focal highlights that are venerated as fundamental values of high esteem in a selective few of many scattered religions. But with each of these goes a whole plethora of subsidiary values and beliefs that are tied in with their central core, and whereas such a resume or listing would be endless, we are here primarily concerned with those fundamental values that are held sacred by our own race, the White Race. It is these values we want to examine, to analyze, and to keep and treasure, or, if found wanting, to discard on the scrap heap of history and replace with a more deserving set of values. In the chapters following we first of all carefully examine twelve major religions, what they stand for, along with a short resume of their origins and their history. We also want to know how they relate to the White Race, and in particular how they compare to our own religion, Creativity, when we put their various concepts to the acid test as to whether they are either beneficial or detrimental to the White Race. 2) Turn the other cheek. 4) Sell all thou hast. 6) Don’t plan for the future. 7) Don’t store up treasures on earth, store up treasures in heaven. 8) The Jews are God’s chosen people, the Old Testament tells us over and over, a thousand times. There is more in the same vein, but I believe we have succinctly set out the inherent tenets of Christianity. In essence, the whole creed and programme is based on some dubious other world, a nebulous supernatural world, one that is undefined, having no known location and no known verification as to its existence. In short, it is all based on wild claims, on speculation, and hopefully, on the gullibility of its intended victims. We Creators reject these nonsensical, nebulous out-of-this-world claims in their entirety and get down to reality. Of these mountains of problems facing the real world today, not the least of our concerns is the survival, expansion and advancement of our own precious race, the White Race. To us Creators our White gene pool is our most precious treasure of all, a treasure that is irreplaceable, and must be guarded from depletion and contamination at all costs. And herein lies the fundamental departure of our values from those artificial and hypothetical values espoused by Christianity. Whereas Christianity worships Jesus Christ and who teaches them to love their enemies and hate and destroy their own kind, we Creators say just the opposite. Instead let us revere, respect and defend our own kind – Nature’s Finest, and base our beliefs and knowledge on the Eternal Laws of Nature, the source and bedrock of all knowledge and wisdom. In our book, a race traitor is the most despicable and repugnant of all vermin, a mutant cretin in Nature’s realm, to be despised and expunged from our society. As can be clearly seen, the gulf between our values and those traditionally held by Christians is as wide as the Grand Canyon, and these differences remain forever irreconcilable. The racial conflagration is heating up daily all over the world, and nowhere more rapidly than right here in the South Africa. Either the White Race will shortly mobilize and rally its immense, but dwindling resources for its own best interests, or it will suffer a dismal fate. Mayhem, mass murder, and finally, total extinction will be the price paid for not guarding our precious gene pool. In answer to the question asked earlier, has Christianity been beneficial or detrimental to the White Race, we furthermore come to the studied and unequivocal conclusion that Christianity has been, and still is, an unmitigated disaster of unparalleled magnitude. Therein lies our true Revolution Of Values. Our race is our religion and we look to the Eternal Laws of Nature. 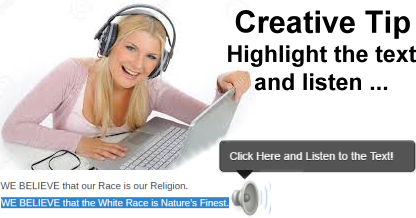 We furthermore state that unless we replace Jewish Christianity with a sane, realistic set of values, such as we espouse in Creativity, the White Race is doomed to extinction and mankind as such will revert and sink back to its lowest levels of savagery such as can be viewed in the untamed jungles of Africa and New Guinea. We Creators are determined that such must never happen. Instead we intend to go forward triumphantly on the chariots of a creative and constructive religion to build a Whiter and Brighter World for the future children of Nature’s Finest.